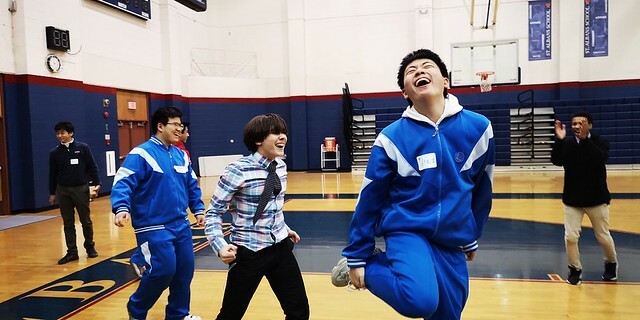 While touring the United States, students from the Yu Yuan Tan School in Beijing, China, stopped by St. Albans to meet their American pen pals, Forms II, III, and IV students enrolled in Chinese classes. Students from the two schools have been exchanging emails since November and were excited to meet in person. Our guests enjoyed a family-style lunch in the Cafritz Refectory and then toured our campus and Washington National Cathedral. The boys also managed to squeeze in a game of basketball. The St. Albans students, who have been studying Chinese for two to four years, appreciated the chance to communicate with their friends in Chinese. The two groups will meet up again in Beijing during the NCS-STA China trip this summer.